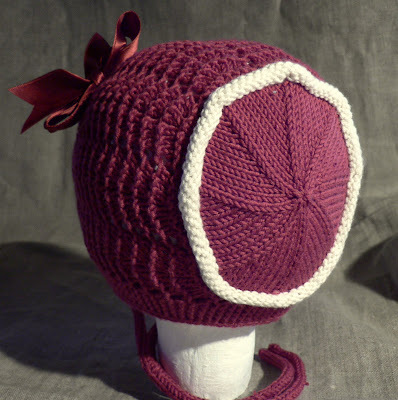 Ever since I knitted Pikku-Pete hat, baby hats have been bouncing around my head. While Pikku-Pete is sporty with its visor, Pikku-Lilli is a bit more soft with lace. They both have this old fashioned-feel to them but with modern yarns and colors, their look is just right for today. 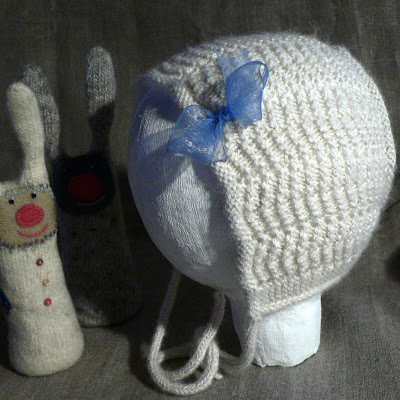 Pikku-Lilli can be knit with one color or with two-colors or with even more. There are many places to play with colors, the edge around the face, the piping in the back, the striping in the main body and then the ties. It can be fashioned towards the old times with silk-ribbon bow. The body is knitted in one piece with only one seam with few stitches to graft. It is fairly quick to knit and there is plenty to keep one entertained during the whole process. There is a bit of purling, lace and stockinette, just little bit of each, so little that one cannot get bored. If you have never done piping, there are instructions for doing it. 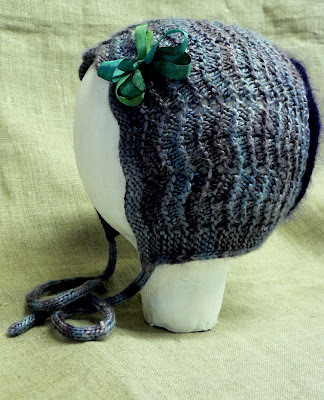 The beauty of knitting in my mind is the flexibility of making the fabric, with increases and decreases one can sculpt the yarn into just about any form. How the fabric grows in one's hands is almost like organic process, one stitch builds onto another and one shape can turn into another seamlessly by careful planning. I think this is the best way to describe how Lilli takes shape. Sometimes no matter how well you plan, one cannot avoid seams, but the way Lilli is constructed, it is almost seamless (except this above mentioned short Kitchener stitch strip - 9 stitches to be exact). I loved the process, and I do love the outcome! 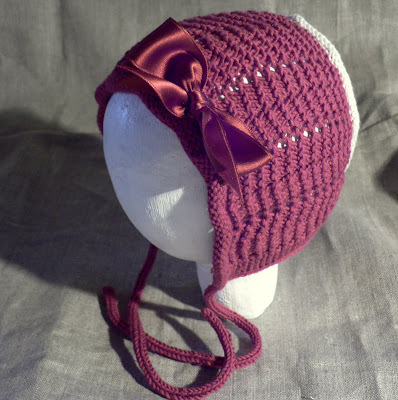 The pattern for Pikku-Lilli is in my Ravelry shop should you like to make it too. While I sit here at my desk I can feel that it is very cold outside. Cold air is spreading over most of Europe this week and we are already getting some of it. It is -23°C (-10F), for us this is normal in January and February, but for large parts in the south this is not normal, I sincerely hope that where ever you are, you are warm. Thank you for publishing this pattern. 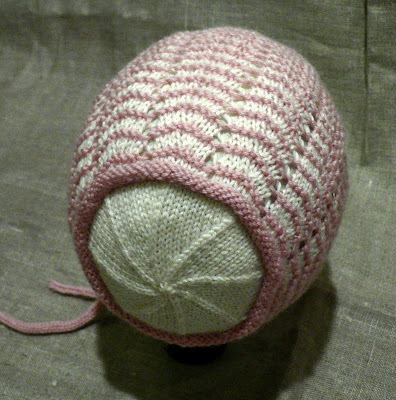 I so look forward to knitting this tiny gem of a hat. Beautiful hats for beautiful babies. Thanks so much. Voi ei, miten suloinen vauvahattu! I love your hats they are absolutely beautiful. There is something really special about your children's patterns. I'm going to get started on this one just to have in hand for a gift. Just picked up the pattern Lene and thank you! Any chance the bunny pattern might be available one day? A big hello form the Pacific NW coast! I'm really surprised at how quickly your day length increases. It seems like yesterday the day length was 2 hours and 5 minutes up there. That is a lovely little hat. I too am surprise by how quickly your daylight is lengthening each day. Just at Christmas it was down to about 2 hours and now over 5. I am quickly knitting this precious bonnet before my granddaughter gets too big...as with all your patterns it is perfect! keep up the good work, you are my favorite designer.